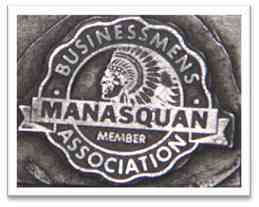 ​Manasquan Chamber of Commerce was established in 1960, succeeding the Manasquan Businessmen's Association. Today, the Chamber consists of over 130 members who not only contribute to the economic vibrancy and vitality of our wonderful seaside town but are proud to be an integral part of the social fabric of Manasquan and its neighbors. The Chamber organizes and sponsors many local events throughout each year for the enjoyment of our residents and visitors from near and far. In addition to improving the quality of life in our town, the Chamber serves as a unified voice for the business community and actively engages in marketing and public relations, information gathering and distribution, tourism, economic development, and liaising with local government. Members benefit through opportunities to market their goods and services to the community, network with other member businesses, promote themselves more effectively, and can avail themselves of numerous inter-member discounts and other benefits.